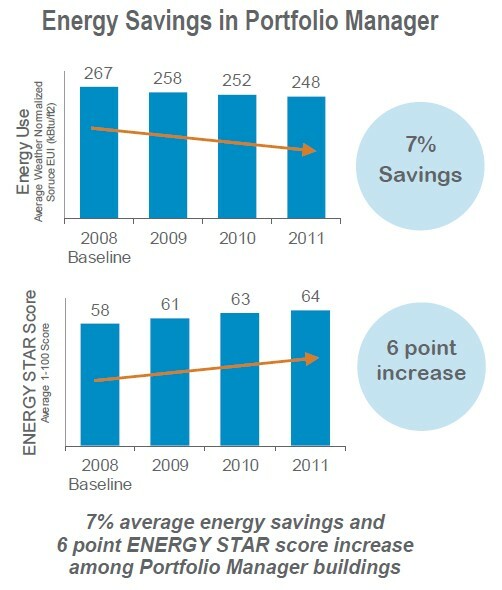 Do Buildings that use Energy Star’s Portfolio Manager save energy? Do buildings that consistently benchmark energy performance save energy? The answer is yes, based on the large number of buildings using the U.S. Environmental Protection Agency’s (EPA’s) ENERGY STAR Portfolio Manager to track and manage energy use. After making this claim the EPA offers the following supporting evidence. Over 35,000 buildings entered complete energy data in Portfolio Manager and received ENERGY STAR scores for 2008 through 2011, which represents three years of change from a 2008 baseline. These buildings realized savings every year, as measured by average weather-normalized energy use intensity and the ENERGY STAR score, which accounts for business activity. Their average annual savings is 2.4%, with a total savings of 7.0% and score increase of 6 points over the period of analysis. What does this mean? Does this mean that every one of the 35,000 buildings in question saw energy savings? Impossible – over time some buildings saw their energy use go up and others saw it go down. The statement clearly refers to an average result. But what is being averaged? The EPA is referring to the average (weather normalized) source energy intensity (EUI) for these 35,000 buildings — saying that it has decreased by 7% over three years In addition it points out that the average Energy Star score for these buildings has increased by 6 points over three years. The graphs below summarize these trends. It may be that these 35,000 buildings, in total, save energy. But we don’t know and the EPA has offered no evidence to show that they do. Moreover, I have asked the EPA to supply this evidence and they refuse to do so. It is an easy calculation – but they choose not to share the result. You can bet they have performed this calculation – why do you suppose they don’t share the result? Now turn to the increased average Energy Star score. There is actually no connection whatsoever between the average Energy Star score for a set of buildings and their total energy use. For a single building, its Energy Star score, combined with its measured EUI and gsf allows you to calculate the energy it saved as compared with its predicted energy use. Readers might be surprised to learn that a building’s Energy Star score can go up while its energy use rises as well. But for a collection of buildings no such relationship exists. If they are all one type of building (for instance, all dormitories) you can combine their individual scores with their individual gsf and their individual EUI to learn something about their total energy – but absent this additional information it is hopeless. And if the buildings are from more than one building type there is absolutely no meaning to their average Energy Star Score. Such statistics are intended only to impress the ignorant. The EPA, therefore, has presented no evidence to support the claim that buildings that are regularly scored in Portfolio Manager collectively save energy. Instead they have offered meaningless sound bites — claims that sound good but have no scientific relevance. It is easy to see the problem by considering a simple case — two buildings – one a 100,000 sf office building and the other a 10,000 sf medical office. Suppose in year 1 the office building has an EUI of 100 kBtu/sf and an Energy Star Score of 60, while in year 2 it has an EUI of 120 kBtu/sf and an Energy Star Score of 58. Suppose that the medical office building in year 1 has an EUI and Energy Star score of 140 kBtu/sf and 50, respectively, and in the year 2 an EUI of 120 kBtu/sf and an Energy Star score of 60. In this simple example the “average EUI” for year 1 is 120 kBtu/sf and for year two is 110 kBtu/sf – by the EPA’s standards, an 8% energy savings. But when you work out the numbers you find their combined energy use in year two actually rose by 14%. Surely EPA officials understand the difference. To summarize, the EPA has claimed that the energy consumption of buildings that regularly use portfolio manager has gone down by 2.4% per year but they have offered no evidence to support this – only evidence that the average EUI for these 35,000 buildings – a meaningless figure, has gone down. The EPA should either withdraw their claim or provide the evidence to back it up. This entry was posted in building energy, Energy Star, EPA by The Pragmatic Steward. Bookmark the permalink.